3 What is Swarm Electrification? 4 What problems remain to be solved? Imagine a Beach party in the Philippines far away from the big cities: flashing lights, loud music, laughter. The film scene we were shown was made possible by a mini grid - a single photovoltaic module feeding one battery could not have made it possible. In Germany there is a 100% electrical grid connection which connects 0.08 billion people - but according to the United Nations Foundation worldwide 1.3 billion people lack that access. In India the percentage of people who lack access to electricity amounted to 34% in 2009. Another billion of those who are electrified are only provided poor quality: electricity comes only limited time of the day and power cuts are experienced regularly. For the research team of “Microenergy-Systems” at the Technical University (TU) of Berlin this seems like a huge market for innovative approaches. Especially because the experts from the International Energy Agency (IEA) expect in their “Energy for All Case” that 70% of the non-electrified rural areas cannot be reached with centralized grids, but only with mini-grids or stand-alone off-grid solutions. In urban regions people can be classified as temporarily on-grid. So even if energy prices in for example India are much lower than in Germany this still means no advantage for small or medium businesses because this electricity comes with much poorer quality. In suburban areas poor people can live in sight of electrical power lines without having their own connection. The needed transformer station provides too much costs – an official program would be needed to subsidize the electrification. From a new perspective people living here could be called close-to-grid. In rural areas far from transmission lines the population is classified as off-grid. To change these people's lives for the better a new perspective is needed: providing decentralized energy access so these people can have their own electricity generation. Waiting for political policies to change facing the task of connecting rural areas doesn’t seem to be satisfying. By installing solar home systems (SHS), diesel generators and other electricity producing options and connecting them to form small grids is a proactive way for rural village populations to become electrified. The basis for swarm electrification are households and small businesses in rural undeveloped areas - to develop a micro empowerment from the bottom-up. The implementation of this new SHS technological approach is end-user financed by providing micro loans according to the example of the Grameen Bank. These systems generally have a payback period of one to three years and can guarantee three days of electricity autonomy in case of cloudy conditions. 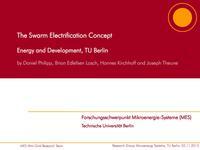 To get more information on swarm electrification please visit MicroEnergy International's Homepage. Why would the big utilities go that last step at phase 3? Utilities are driven by politicians that are interested in high electrification rates which they could easily augment with one step. The main reason for power cuts is overload which could be minimized by a bigger grid. Utilities could cut off that part of the grid (islanding) if they realize that the frequency in the grid is unstable. Additionally, the investment for the utility is comparatively low because the power meters are already there and with one step they could connect thousands. What problems remain to be solved? In this workshop done by Daniel Philipp, Hannes Kirchhoff, Brian Edlefsen and Joseph Theune four main questions were discussed in small groups: AC or DC systems, mesh or bus interconnection, the role of Information and Communication Technology (ICT) and connecting a swarm grid to another swarm grid. In the late 19th century, Edison and Tesla were fighting about what technology to use for electricity transportation. At that time technology for transformation of DC voltage levels was not as developed as today and so Tesla and his AC technology won the battle. Nowadays, switches for DC voltages are possible and there are even applications in which only DC transmission is possible. AC transformers work with induction: as the current flow constantly changes direction it induces a magnetic field in the transformers magnetic core which in its turn induces an alternating current flow in the windings of the attached transmission line. This makes it easy to step up voltages to high levels for transmission to reduce losses over long distances. However it also can cause losses to surroundings by e.g. induction in water, air or earth. That is why today transmission cables through the oceans cannot work with alternating current but use high-voltage direct current (HVDC) cables instead. The problem with direct current is that transmission at low voltage levels suffers from voltage drop which increases with distance. However, these losses are not important in a swarm grid because the distances between the houses are very short. Another problem was the possibility of transforming voltage levels. On the one hand, areas in which swarm grids could be installed do not necessarily need voltage transformations: DC SHS appliances already run today from the solar charge controller on 12 volts. On the other hand, AC devices such as washing machines (which are not installed today in areas of interest) could be designed using a motor working with DC to overcome this problem. Another argument against using DC cables is the safety of the system. In AC systems the current builds up in a sine curve, alternating between positive and negative voltages at e.g. 50Hz. This means that in theory if you touch an open AC wiring you will only be exposed to the maximum power for a fraction of a second before it switches polarity, giving you a chance to get away from the wiring before being seriously harmed. In DC wiring this looks different: both voltage and current are constant. So if you touch an open DC wiring with a comparable power output to the typical western transmission grid, you won't be able to free yourself from the wire and you could die from the electrical energy transferred to your body. However, in rural areas with solar home systems designed to light a light bulb and charge your mobile phone, the power (current) in the grid is so low that you cannot die from touching an open wiring even if both current and voltage are stable. Generation in off-grid areas normally is DC as are most important devices. The evolution of a compact grid in those areas makes it possible to design a DC grid right from the start. DC transmission is more efficient than AC. At DC voltage levels of up to 24 volts there is no safety problem if someone should touch an open wiring. Electrical grids can be designed differently according to how stable the grid should be and depending on the available start up capital for setting the system up. The two basic types are the mesh design and the bus design. The first one offers the best quality of electricity supply but comes with high costs. Mesh grids look somewhat like a spider net with the house units sitting at the knots between the straight lines and the net circles. Comparatively a lot of cables are needed for this design but if one of the cables gets destroyed the grid will continue working. The bus type is the most economical variant but is not resistant to power failures. The houses are interlinked like pearls on an open necklace - one to another. It is obvious how the last houses will be cut off from the grid in case of a cable failure. In the case of rural areas the aim is to connect the houses of a village with DC cables. But engineers have to find the best solutions to make the grid both fanciable and to provide with a stable network. Additional factors as pointed out above have to be regarded: if there are different voltage levels in the village, AC generation (e.g. diesel generator) or AC consumption (e.g. refrigerator) expansive inverters are needed. Both the number of inverters as the length of the cabling has to be efficiently calculated. The monitoring of the grid has to be made possible and simplified by reducing the number of meters and connections as much as viable. The grid has to be designed by optimizing stableness and price. Factors that increase costs are: inverters, meters and length of cables. The group could not decide on an optimal design and created a nice piece of art instead (see figure below). According to the Worldbank three quarters of the worlds population has access to information and communication technology (ICT), such as cell phones. Mobile phone towers are distributed in most of the developing areas as money for communication matters is spent from the people. These could be used according to the anchor business community (ABC) concept for building up decentralized power grids. In off-grid areas a technological leap frog scenario is obvious: land lines bringing telephone connections to small villages are as rare as power lines getting them connected to the urban areas. Cell phone towers, on the contrary, are wide spread. In a business scenario these could be used as anchors for the funding of swarm grids. On the one hand, cell phone towers have to be provided with energy potential of about 3.5 kW which could mean a base consumption load for a grid that small businesses could build up upon. To be provided with energy mobile connection companies could fund the construction of a mini grid. Also ICT can be used practically to stabilize the net by smart metering, to offer remote monitoring of solar home systems and mobile payment. The term remote monitoring describes the idea of evaluating the data from the solar charge controller to find out what could be the problem of a solar system and to send a maintenance operator well equipped to the site. Mobile payment means that centralized data management provides each home connected to a swarm grid with the information how much power they needed and generated and in which amount of money that results. These technology packages can also cut off the electricity system if the household does not pay the loan. An important risk this scenario has is that the data is collected to a big amount and interpreted into user profiles. In Short: Chances of anchoring swarm grids on mobile phone towers are: funding opportunities, assured base load for the grid. Chances of Information and Communication Technologies (ICT) for swarm grids are: smart metering could stabilize the net, remote monitoring could help to maintain the system and mobile payment is an easy way to let people pay. Risks are that too much data is collected and interpreted disregarding intimacy and homes could be falsely cut off the net when the system works badly. The most obvious way is to connect the swarm grid to a national grid. In a rural area with neighboring villages a swarm grid could be connected to another swarm grid. A swarm grid built up of several solar homes could be connected to a mini grid which differs from a swarm grid because the households are not producing energy but consuming only from a centralized generation and storage unit. 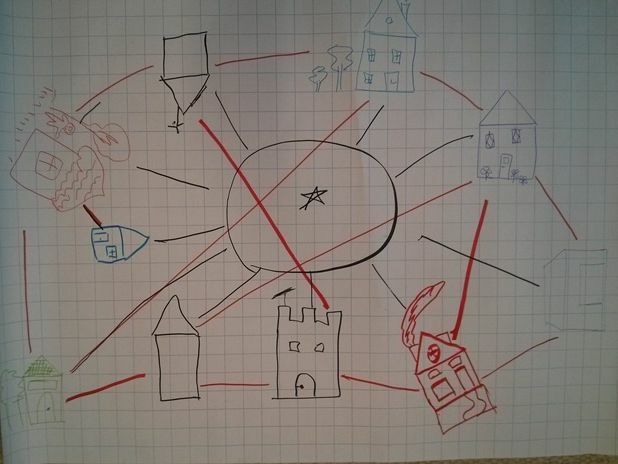 This group took a look at the advantages and disadvantages of connection scenario 2. The advantages of such a system would be that it could be more stable with less power cuts as the load and the generation experience less peaks with many connected households and with a higher storage capacity. Also the operation and maintenance (O&M) costs per household would decrease both in regards to work being done on the grid as the individual solar systems when reparations are done on several systems on one visit. Disadvantages could be higher peak loads at nights and the connection technology has to be paid. ↑ OECD/IEA (2011): Energy for All. Financing Access for the Poor. Special early excerpt of the World Energy Outlook 2011, Paris, S.21. This page was last modified on 15 August 2014, at 16:21.